Most bands seemingly trudge along in obscurity for years before eventually coming to the attention of music fans. But a slow plod was not for Lovelorn, the new Belgian band formed by Ladyhell (ex-Skeptical Minds, Valkyre) and Corpus Christi (ex-Free Launch) in late 2010. After hitting it off while collaborating on the Road to Consciousness rock-metal opera project, Ladyhell and Corpus Christi moved at warp speed. Fast forward a few months to February 2011, and violà! 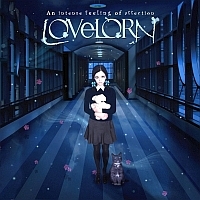 Lovelorn launched An Intense Feeling of Affection, the band’s five-song debut EP that combines alternative, rock, metal, electro and ambient elements. Sonic Cathedral’s Robin Stryker caught up with songstress Ladyhell by phone for a candid chat about Lovelorn, the insane side of love, how being a new mom affects her music, and much more. (And, ah, what a lovely accent she has!) Come discover the freshest band on the metal scene. Robin: Metal greetings from Sonic Cathedral webzine, Ladyhell! How are you today? Robin: Lovelorn’s EP, An Intense Feeling of Affection, just hit the streets in early February. Would you tell our readers about Lovelorn, and also introduce us to your debut EP? Ladyhell: Well, Lovelorn was formed some months ago, so it is really a fresh new band. It started because I was singing for a project called the Road to Consciousness, which is a rock-metal opera. I met the mastermind of the project, and really liked the way he was composing. And we really got on well together, so I proposed to him to start a new project because, at that moment, I had nothing. I just gave birth to my little girl, and wanted to go back on the scene. So, that’s how it started. Robin: It sounds like Lovelorn absolutely took off like a rocket, once you and Corpus Christi came together. In six months, the songs were written, recorded and mixed; you had the cover artwork done and the CD booklet; and the EP was pressed and on the streets. Ladyhell: (laughs) Yes, I’m like that. Once I really am into a project, I am TOTALLY into it. Yeah, it went fast, it’s true. But, you know, I was also a long time at home with my baby. So when she was sleeping or something, what am I doing? Well, I’m on the Internet, I’m on Facebook, I’m working on the songs, I’m working on the graphics more, I create relationships with people to help me with the project. And yes, it went fast. I’m not really patient, so I like that things go … well, not fast … it has to be well done, of course. But, when I see that it is going good, then I like that it goes not too slow. Robin: I love the quote from Lovelorn’s site, “Lovelorn tells stories about love, all forms of love: passion, destruction, hate, motherhood [and] perversion.” I’m interested to hear your thoughts on perversion and hate as being other faces of love. Ladyhell: Well, there is one song called “Something Wrong”, and I was inspired by a story that happened in Belgium, actually. There was a woman who loved a man ... (laughs) of course, it is always starting like that! … and then, she found out that he was also with another woman. Both women subscribed to a parachuting school. I don’t know if you say that “a parachuting club”? Robin: Yes, that’s the term. Ladyhell: So that girl was jealous of the other one, and she decided to destroy the parachute of the other girl … it is really a true story … well, the woman jumped, and she died of course. That story inspired me, and I thought, “Yeah, it’s a form of love.” You know? She is so in love that she cannot see what is good or what is wrong anymore. She is so into her love that she has no more realism; she is not rational anymore. Yes, it’s a form of love, but it’s horrible. Robin: The crazy face of love! You wrote all of the lyrics for An Intense Feeling of Affection. When you are writing lyrics, what generally inspires you? Do you tend to write from external events (like the parachuting story) or internal events or both? Ladyhell: Both! Because with “Something Wrong”, we don’t speak English as our native language and are starting with two words -- something wrong -- in the chorus. And I was wondering what came next. Well, NOTHING. (laughs) And then, I heard that story and thought, “Okay, there is something wrong, there! I can start with that.” So, it can happen like that, or in another way. I wanted to talk about my daughter, so “Little Princess Euphoria” is about a private subject that I also wanted to talk about. Robin: Speaking of your little princess, Emma, has being a new mother changed how you approach either being a musician or writing music? Ladyhell: It actually changed a ton of stuff. I won’t say that I totally changed in my mind, but there is some stuff that changed. Did you know, some time ago, I was in the band Skeptical Minds? And I was more under pressure. All the time ... under pressure. Under pressure before going on stage, under pressure in the articles, all the time under pressure because I wanted to give my best. Then, at one moment, you are not happy anymore because you are too much under pressure. And THIS time, I thought, “Okay, I’m starting a new project, but I will NOT be under pressure anymore! Because, actually, if it doesn’t work, we don’t care.” What I mean is, it’s not a serious matter in life. Now, it’s like: “Be cool. Your daughter, is important; that is what is REALLY important. If Lovelorn doesn’t work, if nobody likes that music, well too bad. You like it, and that’s okay. That is the important thing.” So really, I try to be cooler. We will have our first concert at the end of March, and I really hope also that I will be cooler before going on stage. (laughs) You know, to stop the pressure. Robin: If I understand correctly, you voice also changed as a result of becoming a mom. Ladyhell: Yeah, I can now do higher notes and lower notes. Robin: Was that a complete surprise? Ladyhell: Not really, I still have a singing teacher because I like to train a lot … he is an opera singer, a tenor … and he told me, “I know some women, and their voices changed. So maybe yours will change too.” We thought I would have lower notes, but we never thought I would have also higher notes. So, the surprise was the higher notes. But it’s a COOL surprise! Robin: That’s a VERY cool surprise! Your passion for music started when you were a small child. Who have been your biggest influences -- whether musical or otherwise -- in encouraging you to actually pursue that dream? 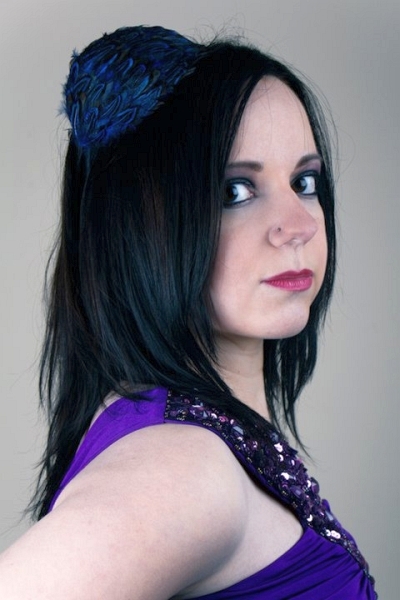 Ladyhell: I don’t think I have a main influence, I don’t have ONE person or ONE band. I have several bands, and it’s different at different periods of my life. When I was a child, already I had a person that I really liked. She is a French singer … I think you know her now because she is the girlfriend of Johnny Depp … it’s Vanessa Paradis. Do you know her? Ladyhell: Okay yes, I was really a fan of hers. That’s how I wanted to start. But then, of course … well, it didn’t change because I still like her … but I was really listening to pop when I was a child. Then I started to listen to rock, grunge, and also Brit Rock in the 1990s, when I was a teenager. And it was really late that I started to listen to metal, because I had no clue about metal. It was one of my boyfriends who gave me a CD of The Gathering’s How To Measure A Planet, and said, “Well, listen to that, you will like it!” And immediately, I really fell for the voice of Anneke, and I listened to that CD all the time. Of course, I was curious and started to think, “Okay, are there other bands?” Then I started to listen to Lacuna Coil. And violà! That’s how it went. So all these people that I just talked about, they influenced me. Robin: What did your family think about you becoming a musician? Did they encourage you, or did they tell you to pursue something more practical? Ladyhell: Actually, they didn’t have to say that to me, because I did both. So I always went on with my studies, and I always did music also. In my spare time, I was doing music, and then I was going to school. Then after, I went to work, and I was juggling music in my spare time. So it was not a problem. No, my parents were really supportive. They came to see me at Metal Female Voices Fest and stuff like that. (laughs) They are not at all metal listeners! But they were there to support me, and I think it’s really cool. Robin: It’s wonderful that you have your family’s support! Do you think they will be able to see Lovelorn’s first concert at the On Air Studio (Belgium) in late March? Ladyhell: No, because I think they will keep the little baby girl. Robin: Ah yes, I suppose Princess E might be a bit young for her first metal concert. Robin: Lovelorn started with just you and Corpus Christi. At what point did Hindi Rose (bass guitar) and Gabriel Arkangel (drums) join the Lovelorn family? Ladyhell: We started with the songs. And when we had four or five songs, we thought, “Okay, we will want to play live, so we need a drummer and a bass player.” Corpus Christi knew Gabriel Arkangel, the drummer, so he asked him to join. And me? I knew Hindi Rose, so I asked her to join. For the moment, they are there for live performances, but we are trying to form a BAND … you know, to really have a band that is more than just the project of Corpus Christi and Ladyhell. When we will make the full-length album, then we will be more integrated. Robin: How is the search for a second guitarist going? Ladyhell: Huh, well we have a rehearsal tomorrow with a guitar player. It’s going okay. We saw several guitar players, and we have to make a choice. I think we will make a choice after that rehearsal tomorrow. But it is going okay. Robin: Do you have anything special planned for your debut concert with Lovelorn? Robin: The vocalist for Azylya, a band that you will be sharing the stage with at Lovelorn’s debut concert, was also a collaborator on the Road to Consciousness project. Have you shared a stage or sung with Jamie-Lee Smit before? Ladyhell: Actually, she is very young, and I met her when she was 13. I was still in my band Skeptical Minds, and she was a fan. She was very young, then. Two years after that, I left Skeptical Minds. And maybe you don’t know it, but she replaced me. She was the singer of Skeptical Minds for some months. Robin: I didn’t know that. Ladyhell: Now you know! She replaced me just after, and then she left. So actually, yes, we have some background together. Robin: Speaking of having backgrounds together, you are one of the earliest members of Eve’s Apple, the Facebook community of professional female vocalists. How did you get involved with the women of Eve’s Apple? Ladyhell: I think Lisa Middelhauve she built the page of Eve’s Apple, and it was already two or three days that it was there. Then I noticed that page, and I thought, “Oh, that’s cool! I will ask her if she needs help or support.” So I asked her, and immediately she said, “Okay, you’re a member of Eve’s Apple.” It was really easy, actually. That’s how we started. In the beginning, we really had to build it up. Of course, people who are not members of Eve’s Apple only see the page, but we have a whole activity going on backstage. Yeah, we wanted really to build something nice, to build a good group, and to try to make a headquarters. Some of us are more dealing with promotion, the others are more dealing with all the creativity side. So, we are really structured. Robin: One of your fellow Apples -- Gogo Melone, the vocalist for Luna Obscura -- created the album artwork, your logo and also Lovelorn’s MySpace page. How did you meet Gogo? Ladyhell: I met her by Eve’s Apple. I didn’t know all the members of Eve’s Apple, so before, I didn’t know about Gogo. But of course, when I entered the community, I started to check every girl, and then I saw the work of Gogo and was really impressed. I thought, “Wow, that’s great! If we go further with Lovelorn, maybe I will ask her to do our artwork.” And then, yeah, it went on with Lovelorn, so I thought, “Okay, we need a logo. I’m going to ask Gogo.” Then I thought, “Okay, we need an album cover. (laughs) Well, we need EVERYTHING, so I’m going to ask her.” I sent her the music of Lovelorn, and she liked it. She thinks it inspired her. And that’s how we started! Robin: Ladyhell, thank you so much for talking with Sonic Cathedral webzine! Do you have any final words for your new fans and people who may have just discovered Lovelorn’s music today? Ladyhell: Thank you to Sonic Cathedral! I really love that webzine, so I’m am really glad that I could have an interview with you today. What I would say is: what Lovelorn needs for the moment is your support. If you like the music, well then, come and let’s meet on Facebook or in concert. Don’t be shy, leave us comments. I really like that, and I really try to answer everyone. You know, that is what makes me want to go on. If I know that there are people who are involved and that we have support, it is important. For a fresh new band, it’s really important.